Finding a natural looking contour for my pale (very pink) skintone has probably been one of my toughest makeup tasks and the closest I’ve come so far is another Illamasqua product, a powder blush called Rumour. The general criteria for my skin tone consists of two factors. b). be pink-toned enough to avoid looking orange or yellow. Being a total fan of all things cream-based for my dry skin, I was excited to see if the new Illamasqua Cream Pigment in Hollow* would work well as a contour shade. Does it look a little yellow to you or am I scrutinising too hard? I’m definitely hyper-aware of bronzer and contour looking ‘wrong’ so I’m generally pretty tough on them, do you think it works or are there better matches out there? Illamasqua Hollow Cream Pigment (£17.00) is available as part of Illamasqua’s Spring/Summer Toxic Nature Collection and available now from counters, instore and online. 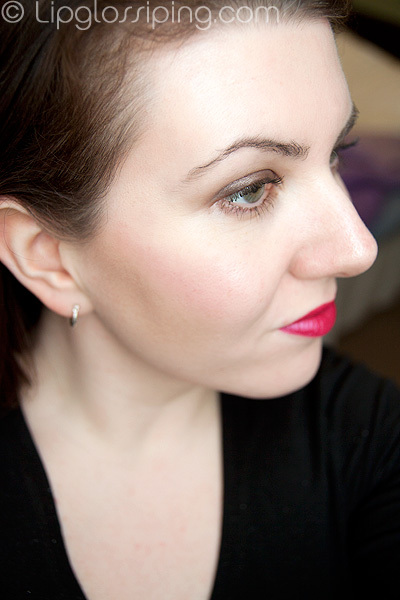 I think it’s too dark as a contour – ideally, I would see a contoured cheek from the side and not the contour color. I’ve heard that mixing a light taupe with a light grey shadow makes a good contour for pale pink skins. Maybe worth a try? I love it, it looks really good on you! I think it will look prettierr if you could blend it more. By the way,what eyeshadow are you wearing? It’s looking super pretty on you. I thought I was being all amazing and clever when I thought this would be good for a contour product until I found out it was being marketed as such at the blogger events, I’m not so clever after all! Anyway, I don’t think its too bad on you. You can see its there but it doesn’t look too yellow and its not an obvious line or anything like that. Disappointingly, I’m pale and I can’t make it show up at all on me. It may well be that as soon as I step outside everyone I pass is going “oh my god look at the stripes on that girls face!” but I just can’t see it and I’m not being overly cautious…perhaps I’m just not that pale! I think you’re right, it does look a little yellow, but with a warmer blush it might look a little different. I’m definitely swooning over the choice of lip colour though, gorgeous! I apologise that this is so unrelated to the topic of the post, but what colour eyeshadow and lipstick do you have on? I really like them! Back on topic: to my untrained eye it looks fine. Not “WOW” but not “OMG what did you do to your face”. I like it, I think I prefer the look of rumour but for dry skin this would work pretty well. Am absolutely loving the lipstick as well. What is it? I think it looks gorgeous. I really wish I understood what people meant by too yellow/pink for their skin types. I feel so self concious that people are always thinking my makeup looks too yellow or pink all the time, even if i think it looks fine lol. I’m pale but have redness, i have a yellow tinge to my skin, ive got acne scars so i dont know what colour to put where lol. I like it but I think I prefer rumour. Loving the lipstick though, what is it? I actually think it looks great. I seem to have the same skin colour as you! oh so pale and pink toned. I found a blusher by NYX , called taupe is a good contour shade. its a pink toned taupe and does seem to match the colour of natural shadows on my skin. I’m keen though to try Meow Minerals ‘Skinny Dippers’ which are contour powders meant to compliment their foundations, of which i adore as they do so many pale foundations in 3 different formulas. I have a very simar skintone so I share your struggle for contour colours. Unfortunately, I don’t think this is it either – a bit too yellow not ‘OMG Jaundice’ but not ‘Holy Cheekbones’ either! Ever so faintly healing-bruiselike on my screen, though I admit it took me a while to notice anything other than your fab eyes and lips! Hmm, this is a tough one, I’m undecided too!!! It surely doesn’t appear too yellow on my screen though, not at all!!! Maybe Delirium is better for those with pink undertones. Starting out? Build your stash without splashing the cash! About (the new YSL Babydoll Mascara, Cara, and) a boy. Jemma Kidd Make Up School Launching on QVC Today!